With Delighted, there are a number of ways you can manage your sending – both manual as well as automatic. Each method discussed below works with our Email and SMS platforms. Here are the key ways to send with Delighted. With one-time surveys, you’ll simply import a batch of people and send them a survey. These surveys don’t recur and only go out when you import and send via your account. You can also schedule one-time surveys to go out at a specific date and time in the future. Using Autopilot, you can upload a group of customers, select how often you’d like them to be surveyed, and Autopilot will take care the scheduling. 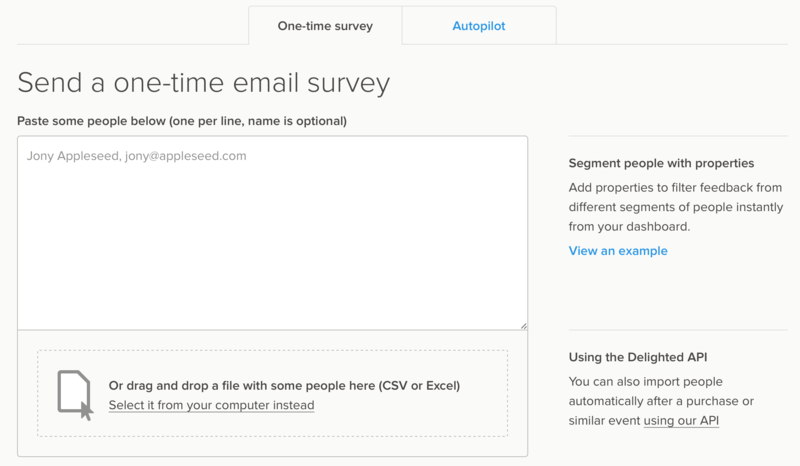 Autopilot will evenly spread out those surveys to ensure you’re getting consistent feedback, as well as recur the surveys at a frequency you select (ex. every 3 months, 6 months, or 12 months). If you would like to learn more about Autopilot, you can view our Autopilot guide. 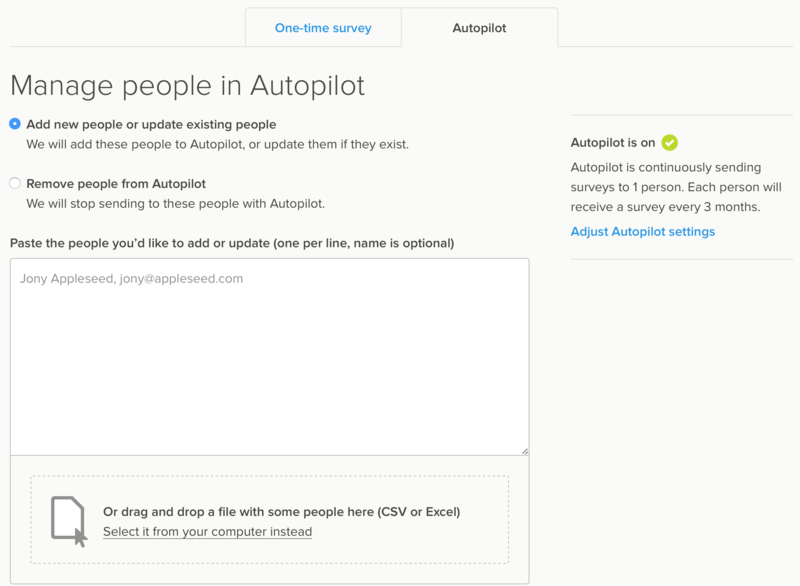 You can easily add and remove people, as well as update the properties of those currently in Autopilot. Need to stop sending? Cancel sending at any time, directly from your Autopilot dashboard. Trigger surveys based on a key activity, such as a transaction or customer milestone. With our API, you can automate the process of sending and ensure the surveys are being sent regularly without the need for manual involvement. Our API includes a range of parameters that can fine-tune the sending process, such as layering in a delay to send the survey X amount of days after a purchase. Additionally, you can pull information from Delighted via API, such as survey responses, metrics, and more. Learn more about our API via our documentation page. Now that we’ve covered how you can send with Delighted, lets review the best practices for selecting who you’ll be surveying.